Dr. C. M. Chang is an Adjunct Professor Emeritus at Department of Industrial and Systems Engineering, State University of New York at Buffalo, Buffalo, New York, USA, where he has taught “Engineering Management” for over 25 years and served, for a brief period of time, as its Director of Service Engineering Master degree program. He has a Ph.D. in engineering and a MBA in business management. Before his retirement from Praxair, a fortune 100 company, he received the Special Recognition Award for Technology Leadership in 1992 and was a business development manager in support of Praxair’s China business. He was an Associate Editor for International Journal of Innovation and technology Management for one year. He is currently servicing as the editor of a 30-book Collection Series on “Engineering Management” for Momentum Press. His book on “Engineering Management: Challenges in the New Millennium” received the “Best Book Award 2007” from International Association for Management of Technology (IAMOT). 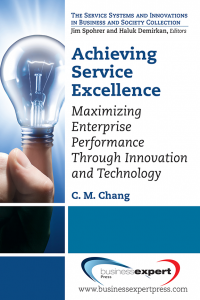 Another book of his on “Service Systems Management and Engineering: Creating Strategic Differentiation and Operational Excellence,” received the “Best Book Award 2011” from IAMOT. He was awarded five US patents, and published a large number of technical articles in journals and conference proceedings. He is a registered Professional Engineer, has served as President of the Erie-Niagara Chapter of New York State Society of Professional Engineers for one year, and is listed in Who’s Who in America, Who’s Who in American Education, and Who’s Who in the World.